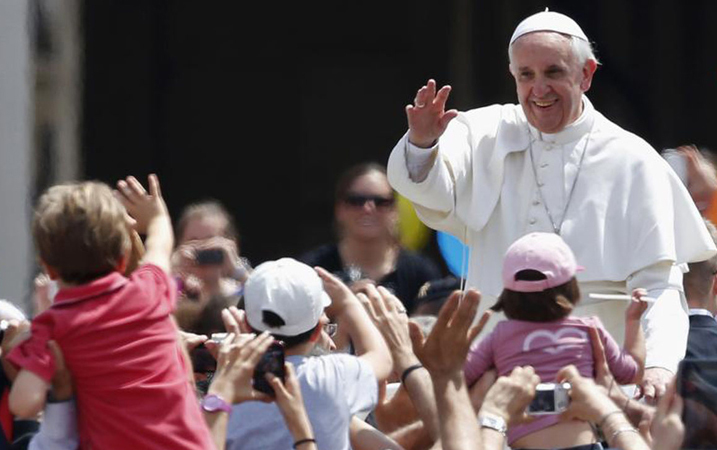 Pope Francis was praised in the New York Times as showing a “deft hand” in diplomacy during his recent American trip. A manifestation of his deft hand was his lamentable failure, especially in his address to the United Nations, to condemn the policy of nuclear deterrence: the idea that peace can be kept by the threat of mass murder. Yes, the Vatican has in the past termed this “the most pressing moral issue of our times,” but that’s all the Vatican has done. I wasn’t disappointed by Francis’s failure to condemn the threat of nuclear mass murder because nothing he has said or done so far has led me to hope that he might do so. His two choices for outstanding examples of American Catholicism, Dorothy Day and Thomas Merton, were in line with his not upsetting his American hosts by calling into question the morality of what has become a militarized, indeed murderous, American foreign policy. Both Day and Merton, for vastly different reasons, were the safest possible choices in this regard. Now that Dorothy Day is safely dead, she’s not around to give Cardinal Dolan fits as she did his predecessor Cardinal Spellman who, his pudgy hand on the stock of a machine gun in Vietnam declared, “My Country Right or Wrong!” Thus Dolan eagerly pursues Dorothy’s cause for sainthood by portraying her as a repentant sinner, opposed to abortion, who devoted her life to the poor. But there’s no mention of Day’s condemnation of the U.S. firebomb raids on Japan or the nuclear massacres inflicted on Hiroshima and Nagasaki, the latter the historic center of Japanese Catholicism. And, needless to say, nothing about Dorothy’s many arrests in the course of her unwavering opposition to American militarism. Merton was an even safer choice. He didn’t like confrontations and never took risks in the cause of peace. I do believe, however, that Francis should, in any event, have thought twice about eulogizing a monk who had carried on an affair for six months with a 25-year-old student-nurse (even as Merton remained secure in the knowledge his snug hermitage was waiting for him whenever he chose to return to the cloister). As to what the young woman thought about being left in the lurch, we don’t know since no one seems to have bothered to ask her. But, then, she wasn’t a celebrity. Had Francis taken the time to visit the infirmary at Fordham University, he could have met, as former CIA man Ray McGovern urged, with a true icon of American Catholicism, 94-year-old Dan Berrigan, S.J. But Dan would not have been a safe choice for Francis. Nor would his brother Phil’s widow, Liz, nor any of the Berrigan family for that matter, nor any of the Plowshares activists, such as Megan Rice, the 86-year-old nun who, after spending forty years as a missionary in West Africa, embarked on a life of crime culminating with her picture on the front page of the New York Times after she, with her relatively youthful companions Michael Walli and Greg Boertje-Obed, made an incredible foray into the super-secure Holy of Holies of American nuclearism, the Y-12 uranium enrichment facility in Oak Ridge, Tennessee. In view of all this, especially with the periodic meeting of world leaders on nuclear proliferation coming up soon (where the nuclear elite won’t feel secure unless they retain enough warheads to destroy the world many times over), the pope had a moral duty to say something further on the morality of nuclear deterrence, which, according to fundamental Catholic moral theology, is intrinsically evil and the source of a host of other evils, including what President Dwight D. Eisenhower called “a theft from the poor” on a scale Ike never envisaged. Yes, Francis did condemn the arms race, but in the usual abstract terms. In speaking to the U.S. Congress, he was addressing the governing body of the major supplier of weaponry to the rest of the world, a nation whose own military budget is not only much greater than that of its closest rival, China, but surpasses the total of the world’s 17 most heavily armed nations. So having failed to speak truth to power, Pope Francis left these shores even more well liked than when he came (save for some disgruntled women, gays and lesbians, and victims of clerical sexual abuse). We Catholics call him the Vicar of Christ, but, as you recall, Christ wasn’t that well liked by the rulers of this world. If he had been, Christianity today would have some symbol other than a cross. A smiley face, perhaps? Another issue the pope failed to mention was human overpopulation, in which most of the issues he mentioned are rooted. It’s truly criminal how much the U.S. has spent, and continues to spend, on nuclear weapons. These are genocidal weapons. Worse — if you use enough of them, they’ll kill most life on planet Earth. Mass biocide. How can destroying God’s creation (from a Christian perspective) possibly be moral? If the Vatican is truly pro-life, nuclear weapons must be condemned as a moral abomination. An abomination of desolation, to use a biblical phrase. It’s high time we eliminate nuclear weapons on planet Earth. P.JSullivan and wjastore, you both are right. Nowadays we are swimming in a sea of words that if analyzed becomes a plain soup of letters. Nothing makes sense when we try to put it in perspective. We invade and kill other countries to teach democracy which we do not practice because we do not follow the Constitution our Founding Fathers left us for guide, we claim to be monotheists but with our actions we kneel in front of many gods, we judge each other’s actions as if we had the power of truth on our side – but being very careful to lie with each one of our statements, we claim to want to fight for our environment while we build new facilities to deal with oil and gas transportation, we spy on every American for security reasons but we are unable to stop massacres by Americans on our own land. We are so used to lie that we do not know anymore what is true. Meanwhile the general public reads in the Reader’s Digest (10/15 page 103) that the USA Military bases are sinking in the ocean, which does not stop us from spending billions in manufacturing new weapons and killing machinery. We know we are superoveropupulated, but we destroy any chance to control it by using false excuses supported by a God’s principles that we continuously deny with our actions. The nuclear power game has been used so many times that we have forgotten how dangerous it is for our survival. We tested it in Japan and became aware of its consequences. But by now we have almost forgotten the results. On top of that we know that using other available substances instead of uranium could deter many of its bad consequences if applied to humanity’s energy needs, but we keep that possibility carefully covered because we want the fear, it is our main power tool. The future is dark, no light can penetrate the invisible cloth that covers it. I need to visit my paradise and talk with my birds. They know the truth but I am too ignorant to understand their message. I only hear its music. Over the weekend, some water leaked from the cooling system of Connecticut’s nuclear power plant on the shores of Long Island Sound. The corporate spokespeople of course issued the standard reassurance to the public: “No radioactive material escaped the facility, there’s no cause for concern.” Local TV news crews interviewed some local residents. One, who had a friend who’s long worked at the facility, expressed his 100% confidence that everything is just fine. But another local told the plain truth: “The plant has been operating here for so long, we’ve grown numb to its presence.” Out of sight, out of mind, even if you drive past the facility five days a week. And thus it long ago became with the ongoing threat of a state to state nuclear weapons exchange. Now, I am not accustomed to riding to the defense of a pope, and I certainly don’t follow the internal affairs of the RC Church. But it seems to me, a complete outsider to that institution but one well aware of its own historical crimes, that Francis’s public pronouncements have been quite unprecedented. My own view is that Global Climate Chaos is actually a bigger issue than nuclear proliferation. We don’t know for certain that a major exchange of nuclear weapons will take place, but those of us who respect Science know that Humankind is on a self-propelled course of voluntary or self-extinction. And this Pope HAS shown an understanding of the magnitude of this crisis and has made, I’ll say it again, unprecedented public pronouncements on the subject. Global warming and the threat of nuclear war are of equal importance. One will finish us off eventual and the other might do the job before noon tomorrow. My problem is that almost everybody is aware of global warming–even the deniers, but no one seems to b e aware of all those MIRV missiles primed and ready. My problem with the pope is that he’s sure of being cheered on by a vast number when he speaks about the danger of global warming and against the death penalty, but all would not go so smoothly–even among liberals–if he condemned nuclear deterrence. We all would prefer not to have our day spoiled by thinking about it. Ditto getting specific about the arms race.